Lionel Dalhousie Robertson Edwards (1878-1966) and Archibald Thorburn (1860-1935) are the foremost sporting watercolourists. Lionel Dalhousie Robertson Edwards (1878-1966) favored the medium of watercolour for his equestrian, racing, sporting and hunting paintings. Edwards produced sporting illustrations for Country Life, The Sphere and The Graphic. At the outbreak of World War I, Edwards volunteered as a Remount Purchasing Officer, along with his contemporaries Cecil Aldin (1870-1935) and Sir Alfred Munnings (1878-1959). Their responsibility was to source and train horses and mules for the British Army. 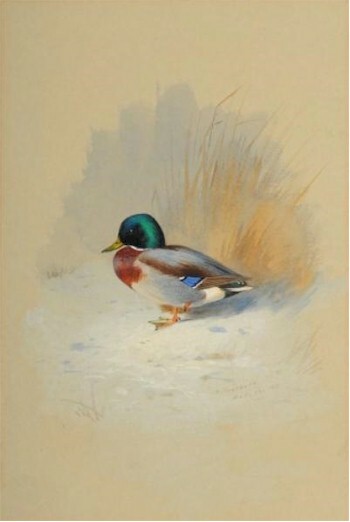 A Study of a Mallard (FS14/449) by Archibald Thorburn (1860-1935). Following the war, Edwards moved to Salisbury and throughout his career illustrated over 30 books including Black Beauty and Lorna Doone. In 1926, Edwards became a member of The Royal Cambrian Academy of Art and in the following year The Royal Institute. 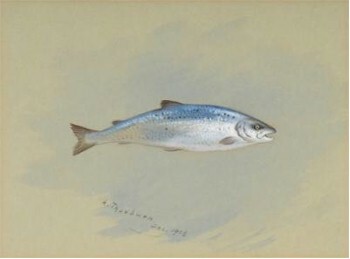 A Study of a Sea Trout (FS14/450) by Archibald Thorburn (1860-1935). Archibald Thorburn (1860-1935) is an artist who we regularly sell at auction and typically we are offered collections of work by Thorburn that have been assembled by wildlife and watercolour enthusiasts. 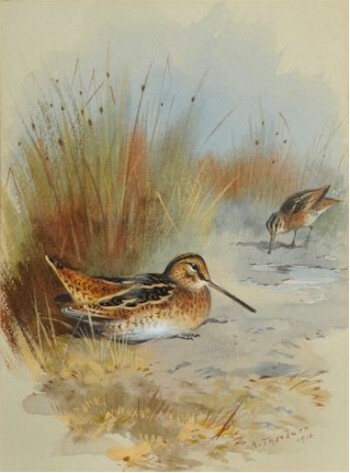 Snipe amongst Grasses (FS14/451) by Archibald Thorburn (1860-1935). Like Edwards, Archibald Thorburn's favorite medium was watercolour and he became in his lifetime an admired and famous illustrator of birds and wildlife. Thorburn painted birds, animals and flowers but with a tremendous knowledge of ornithology, he specialised in the study of game birds. His most acclaimed illustrated work is the four volumes of British Birds, published in 1916. 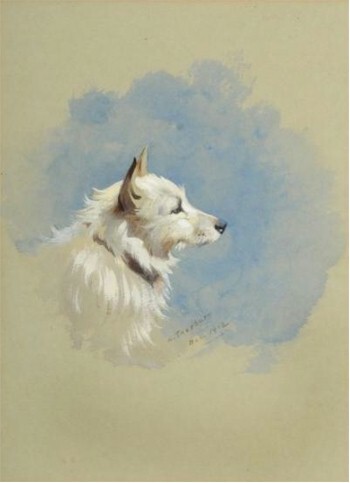 A Study of a Terrier Dog (FS14/453) by Archibald Thorburn (1860-1935).